Place several clean chicken bones into a bowl and cover with vinegar. You should notice small bubbles forming on the bones. 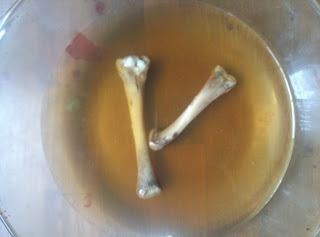 This is the product of a reaction between the vinegar and the calcium in the bones. Cover the bowl and set aside. After several days check your bones. They should begin to feel soft and spongy after a while. This happens because the vinegar has reacted with calcium in the bones. Calcium plays an important role in bone strength and hardness. Without it our bones wouldn't be as strong or hard. -Bones from The Dr. Binocs Show is a great video for kids about the human skeletal system. -Bones And The Human Skeletal System from Ducksters has lots of general information about the human skeletal system plus an online quiz. -Skeletal System from Biology Kids has lots of great information about bones, the human skeleton, x-rays, and more. Our muscles are what allows our body to move. Muscles are attached to bones with ligaments. When our brains send the signal, our muscles contract, moving our bones. This is a really awesome hands on activity for learning about the muscular system. 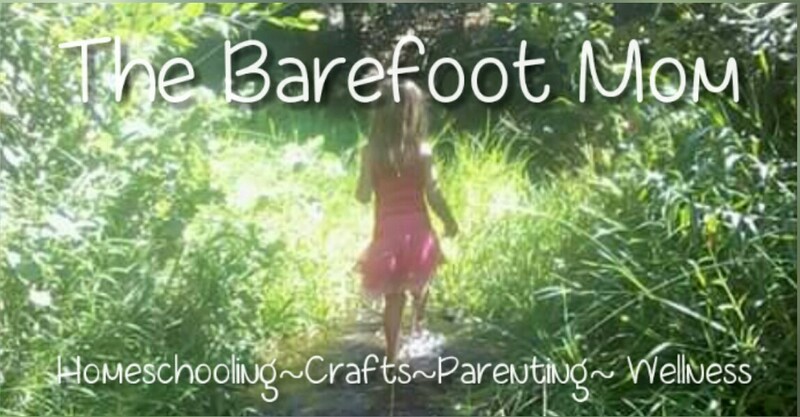 This activity requires a little patience but turns out really awesome! Start by tracing a hand, the bigger the better, so an adult hand is preferable. Next cut the hand out. Cut the plastic straws into small pieces about 1/2 inch long. Tape the straw pieces in a row down each finger. Try to fit 3 on each finger and 2 on the thumb. You can use a few longer sections to run down the hands to the wrist. Taping the pieces on is the part that requires a little patience. It can be a little hard to get them all in place. Cut 5 lengths of string long enough to run down from the tips of the fingers to a few inches past the wrist. Tape a string to the back if each finger tip. 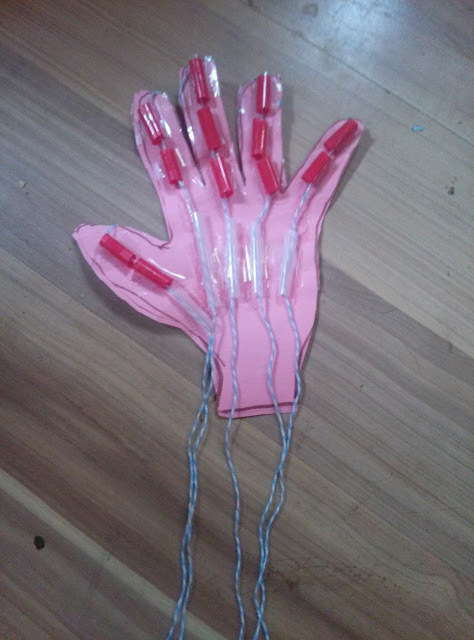 Pull the string over the tip of the finger and string it through the plastic straws running down that finger, then through the straw running to the wrist. Once all the fingers are threaded, you can pull the strings to make the fingers bend open and closed! -How Your Muscular System Works from TED-Ed is a video about how our muscles work to move our body parts. -Biology For Kids: The Muscular System from Ducksters has lots of general information about muscles and the human muscular system. 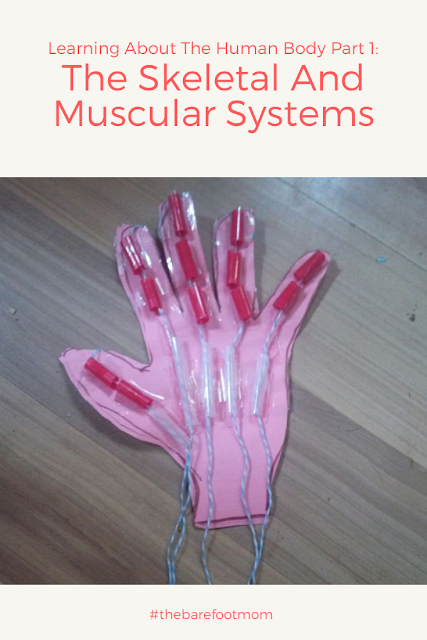 -The Muscular System from Kids Biology has information about how muscles work and the different types of muscles. Part 2: The Respiratory And Circulatory Systems! Looks super fun! We did human body a few weeks ago. I'll have to try the bones in vinegar soon, though. Your Articulated Hand Activity is such a great idea! I am definitely going to try this one at home. Thank you for sharing! 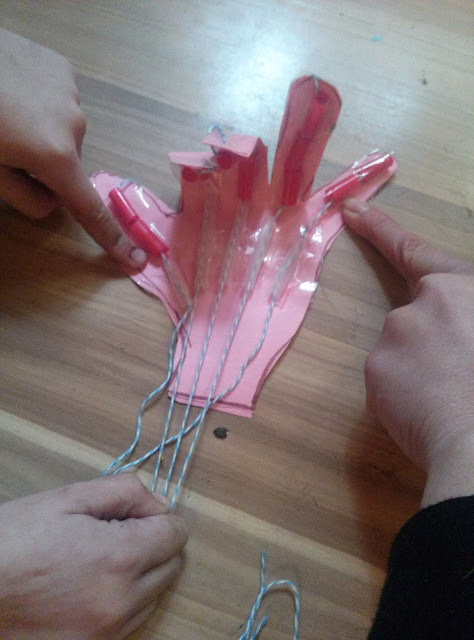 We had so much fun with the articulated hands!